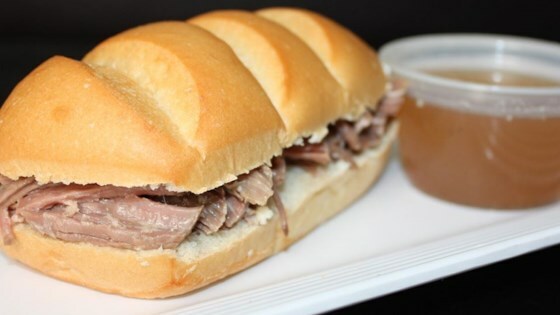 "This recipe makes tender, wonderfully flavored meat that is great for sandwiches. I also like to serve it with flour tortillas, cheese, refried beans, etc. for people to 'build their own burritos'." Place roast in a large pot with water to cover. Mix in bouillon, salt, and garlic salt. Place the bay leaves, peppercorns, oregano, and rosemary in a coffee filter and secure tightly with a rubber band. Add this to the pot. Bring to a boil over high heat, then reduce heat to low, cover with a lid, and simmer for 6 to 8 hours. Remove coffee filter and discard. Remove roast from the pot and shred with two forks. Reserve broth for dipping if desired. See how to make spicy, saucy, shredded barbecued beef. I made this in my crockpot and it turned out really moist and tender.Suggest cutting down on the oregano a little. Definitely a keeper. As a single person,I love this recipe! Lots of leftovers and very versatile. It freezes well! Throw it in a crock pot and forget about it until dinnertime! This recipe was VERY good and easy to make. I would have it more often, but the fat and sodium content is very high. This is a one in a while treat.